With a talent for self-promotion, Orsemus attracted much press coverage. In the 1850s and early 1860s, Orsemus made a prosperous living as a card-writer, travelling the eastern cities and producing at high speed elegant hand-written visiting cards for discerning customers. Doubtless fuelled by a talent for self-promotion, Orsemus attracted much favorable press coverage for his penmanship, announcing his arrival in towns visited. 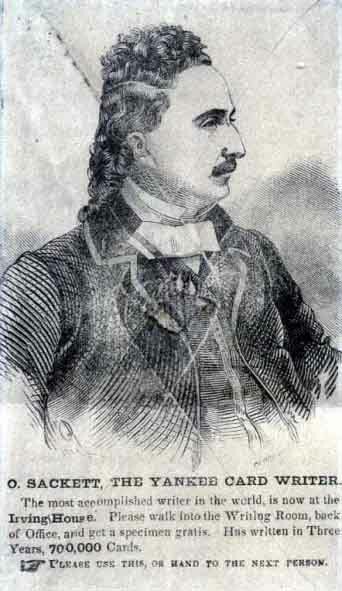 However, he was not universally popular, the Syracuse Daily Courier in 1857 reporting that "Sackett, the impudent puppy who styles himself the "Yankee Card Writer," and is most unfavorably known in this locality, was horse-whipped in New Orleans last week for insulting a lady, and made to leave town for the same offence. He deserved all he got." This account would seem to have been somewhat exaggerated, a subsequent report in the Lowell Daily Citizen revealing that Orsemus's offence had been to "send a couple of ladies a bouquet with a card attached, stating that he wished to make their acquaintance." An uncle of the young ladies "took umbrage at the supposed insult, and castigated the gentleman accordingly." A response in the Boston Post, presumably given by Orsemus, stated that, "The report that the "Yankee Card Writer" had been horse whipped at New Orleans is untrue. The Y.C.W. is not a man to submit to any personal indignity." From the later 1860s, he managed a bureau organising lecture tours from a base in Kansas City. Although it is unclear how much contact Orsemus had with his sons during their early years, it may have been as a result of this business that his son Jacob started his own career as an impresario, and his son Henry, the silhouettist, would appear to have inherited his father's artistic streak. Orsemus took out a patent with the United States Patent Office on 29 July 1879 for a new and improved hotel casket.12 This invention was what might now be called a desk tidy, "to provide for the use of hotels, offices, and other places of business a simple, neat, and compact device for holding conveniently various kinds of inks, pens, pins, cards, envelopes, paper, sand-paper, call-bells, tooth-picks, card-trays, matches, pencils, and similar articles, and also to hold conspicuously various advertisements, cards, notices, directories, and other articles of that character." How O. Sackett, of Grand Rapids, Won His Way. Recollections of Horace Greeley's Trip to Kansas City. One Man Who Has Gained a Competence as a Street Merchant. I have had an interest in The Inter Ocean since its foundation, as I was acquainted with Frank Palmer, who was connected with the paper in the early days. I have watched with pride its growth to a great newspaper. I lived in Chicago when Joseph Medill was working the old lever press during the days of "Long John" Wentworth. Old residents will remember me as the "Yankee Card Writer" at the Sherman House in 1863. I was the original card-writing professor and spent my summers at Saratoga, Newport, Boston, Philadelphia, and other Eastern cities, and made much money. At the close of the war I settled in Kansas City as manager of a lecture bureau in connection with Redpath, of Boston. His bureau sent entertainments to Chicago, and I managed them from Chicago to California. Among my attractions were Horace Greeley, John G. Saxe, Will Carleton, Susan B. Anthony, Artemus Ward, John B. Gough, and others. I was the only agent that Horace Greeley ever lectured for outside of invitations from associations and towns. I learned by the papers that he was to open the St. Louis fair and wrote him, asking for dates in Missouri and Kansas. He replied that inasmuch as he was coming to St. Louis he would give me six dates. His first lecture for me was at Kansas City. After heavy advertising I wrote to learn his price. He replied that he would not make a price, but would leave me to pay him as much as I did others who did not draw any better house than he. "Yes; fifteen years ago I came to Wyandotte to see John Brown. There being no livery stable at Wyandotte, they sent to Kansas City for a livery rig for me, but when they found who it was for they refused to let it come, and I had to go to John Brown's in a lumber wagon." "What did St. Louis pay you for your two lectures?" I asked. "They promised me $100, but have not paid me anything", he said. Mr. Greeley would not ask pay of any man. At his death thousands of bills in notes held by him had not been presented for payment. I paid him $150 a night. I saw Wild Bill with his revolver put thirteen bullets in the "O" of the I.O.O.F. sign at the top of the building in the market square at Kansas City, the thirteen shots making but six reports. The marks of the bullets may be plainly seen today. I am the inventor and hold the only unexpired patent on the beautiful hotel casket now on all first-class hotel counters to hold envelopes, matches, pens, ink, etc. I have had my ups and downs, but have always managed to land on my feet. I came to Grand Rapids in 1879 with $40,000 to manufacture my hotel caskets. I was taken sick after two years and was on my back six years. I lost all my money and began life again with 50 cents. I sell in this small town between 300 and 350 papers daily. I have no news depot, but sell entirely on the street. I am today worth $15,000. Orsemus made a will at Grand RapidsG on 20 May 1896 in which he left his sons, Jacob, Henry, and Fitch, just one dollar each.23 The residue of his estate, which according to newspaper reports was considerable, was to be divided among his nieces, grandchildren and great-grandchildren. Orsemus specified that his assets be sold and the entire proceeds deposited in the Peoples Savings Bank for nineteen years (presumably so that the youngest beneficiary would by then be 21), when the accumulated sum was to be distributed equally to the named beneficiaries. They were named as: nieces Anna Mary Sackett and Eva Sackett, grandchildren Geraldine Irving and Byron Coles Irving, and great-grandchildren Althea Gertrude Wade, Julia Adeall Wade, and William Sherman Wade. Jacob contested the will but, at a hearing of the Kent County, Michigan, probate court held on 25 and 26 September 1896, it was ruled that the will should stand, and probate was granted to Charles Kelsey, the executor appointed by Orsemus. On 12 October 1903, the executor also proved the will at the Ramsey County, Minnesota, probate court after finding that Orsemus had owned real estate there. Orsemus Sackett was clearly an eccentric, but not an unpleasant or unpopular one. Certainly he was popular with the newsboys, some of whom passed a "resolution" stating that they "liked Mr Sackett very much", and that "he was always good to us and gave us jolly times by his sleighrides." The preacher at his funeral described him as "an eccentric who had, in his manner of living, separated himself from the rest of the world and lived a life apart from his fellows, but his qualities were not repellant, and he had attracted much sympathy." Thurmon King's database, 65170 Orsemus Sackett. Email from Molly Sackett to Sackett Discussion List, 21 August 2008, citing research by Robert I Sackett. "Historical Newspapers, Birth, Marriage, & Death Announcements, 1851–2003", digital image, Ancestry.com, New York Times, 19 August 1896, "Obadiah [sic] Sackett Dead. / Grands Rapids, Mich, Aug. 18.—Obadiah Sackett, known all over the United States as "The Yankee News Man," died this evening of old age, aged seven[ty]-seven. The deceased was a native of Boston, and for years was manager of a lecture bureau, and managed Horace Greeley's first tour through the West. For the past eighteen years he has resided in this city and conducted a news agency. The deceased leaves three sons, one a coffee broker in Brooklyn, N.Y. His estate is estimated at $50,000." Same report, with same wrong name, appeared in Boston Daily Globe, 19 August 1896. Date of marriage assumed from birth of first child. 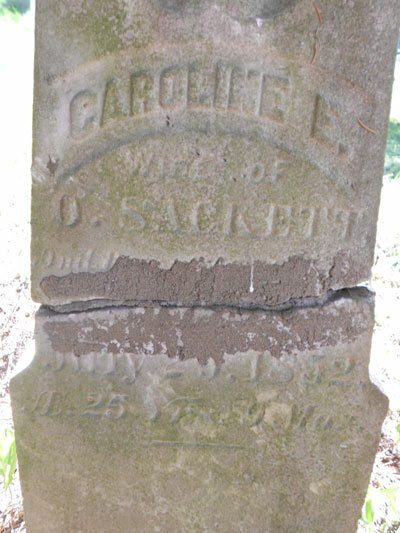 Website Find A Grave (http://www.findagrave.com), memorial #112337169 for Caroline Sackett, created by Paul R, "Caroline E, wife of O. Sackett and ... July 29, 1852, æ 25 yrs 9? m?." "United States Marriages", database, Findmypast, "10 Aug 1858, at Allamakee, Iowa, Orsemus Sackett, 33, to Geraldin H Mathews, 18." Henry Sackett, 10/12, m, b. NY. "Missouri, Jackson County Marriage Records, 1840–1985", digital image, Ancestry.com, "23 Dec 1873 Orsemus Sackett & Nettie Jones. Jackson, Missouri. By F J Boggs, Minister and Pastor, Meth E Church." Article in Grand Rapids Press, 22 Aug 1896, refers to a decree for divorce dated 1891 found among Orsemus's effects. "US Civil War draft registrations records 1863–1865", digital image, Ancestry.com, "Sackett, Orsemas, of Indianapolis, Marion Co, Indiana, 37, card writer, b. NY, class II, enumerated 6th district, Indiana, 31 Jul 1863." Website Google Patent Search, United States Patent Office (http://www.google.com/patents), researched by Wendy Sacket. O Sackett, head, married, 54, b. NH, manuf caskets, father b. NH, mother b. NH. "US City Directories, 1822-1995", digital image, Ancestry.com, Grand Rapids Directory, MI, 1880–81, p303, "Sackett Orsemus, cabinetmkr 205 N Ionia, res 112 Stocking, w s."; p12 (removals & alterations), "Sackett Orsemus, inventor, res 26 Center." "US City Directories, 1822-1995", digital image, Ancestry.com, Grand Rapids Directory, MI, 1881–82, p335, "Sackett Orsemus, office furniture, res 404 Jefferson ave."
"US City Directories, 1822-1995", digital image, Ancestry.com, Grand Rapids Directory, MI, 1883–84, p457, "Sackett Orsemus, res 306 Lyon." "US City Directories, 1822-1995", digital image, Ancestry.com, Grand Rapids Directory, MI, 1889–90, "Sackett Orsemus, news dlr, rms 34 W Bridge." Orsemus Sackett, once a great personal friend of James Fenimore Cooper and a lecturer of some note, is now half blind and destitute and peddles papers for a living on Grand Rapids streets." 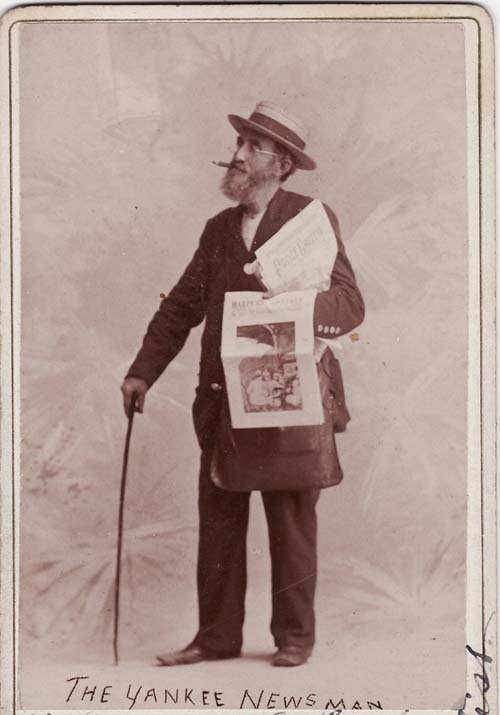 "US City Directories, 1822-1995", digital image, Ancestry.com, Grand Rapids, MI, 1893, "Sackett Orsemus, newsman, rms 50 Canal." The Chicago Tribune, 7 Nov 1894, researched by Kari Roehl. Minneapolis Journal, (Minnesota), 29 Aug 1896. The Daily Inter Ocean, 20 Jun 1895, researched by Kari Roehl. "Minnesota, Wills and Probate Records, 1801–1925", digital image, Ancestry.com, Will of Orsemus Sackett, made 20 May 1896, proved 26 Sep 1896.